A winter helper all dressed up for the holiday season with what looks like a big bag of gifts... Or maybe its coal? Well, the weary mouse who wakes up great winter morning and comes to this tree will know what's inside pretty quickly! The Winter Helper's Perch can be used on the Reaper's Perch. The trap's stats (power, power bonus, attraction bonus, etc.) are not changed. The Winter Helper's Perch may be made available during the annual Great Winter Hunt event and can be traded on the Marketplace or through Give To Friends. 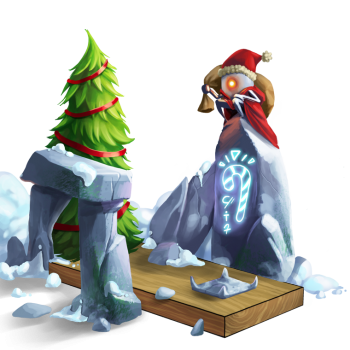 9 December 2014: The Winter Helper's Perch was released as part of the 2014 Great Winter Hunt. This page was last edited on 9 December 2017, at 16:04.